Ok, first of all I know I have slacked off about writing on this new blog. I promise as I get closer to the Fargo Marathon on May 17, I’ll be updating much more frequently. The other thing I have been slacking off on is getting up in the morning to run. I’ve been doing pretty well on the weekends, but I am officially SICK and TIRED of the cold weather. This weekend it will be 60 degrees warmer than it will be tomorrow morning and that only reaches the freezing point. 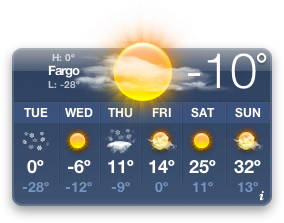 I think I’ll try to run in the evening tonight when it’s warmer (close to zero). That being said I have been traveling for a couple of weeks and had some good runs on the road. A couple weeks ago I was in Albuquerque and had a couple of very nice runs in the high desert. I actually saw coyotes running along the trail. And last week I got in a good workout while in Pittsburgh. The hills there were quite steep and I definitely used some muscles I’m not used to. I will get this blog in shape soon. Just be patient with me.